Modern computers process vast amounts of data that represent various aspects of the world. Data processing is often organized into pipelines of manipulations on sequential streams of data. In this chapter, we consider a suite of techniques process and manipulate data streams. In Chapter 2, we introduced a sequence interface, implemented in Python by built-in data types such as tuple and list. Sequences supported two core operations: querying their length and accessing an element by index. However, representing sequential data using the sequence abstraction has two important limitations. The first is that a sequence of length n typically takes up an amount of memory proportional to n. Therefore, the longer a sequence is, the more memory it takes to represent it. The second limitation of sequences is that sequences can only represent datasets of known, finite length. Many sequential collections that we may want to represent do not have a well-defined length, and some are even infinite. Two mathematical examples of infinite sequences are the positive integers and the Fibonacci numbers. Sequential data sets of unbounded length also appear in other computational domains. For instance, the sequence of all emails ever written grows longer with every second and therefore does not have a fixed length. Likewise, the sequence of telephone calls sent through a cell tower, the sequence of mouse movements made by a computer user, and the sequence of acceleration measurements from sensors on an aircraft all extend without bound as the world evolves. In this chapter, we introduce new constructs for working with sequential data that are designed to accommodate collections of unknown or unbounded length, while using limited memory. The central observation that will lead us to efficient processing of sequential data is that a sequence can be represented using programming constructs without each element being stored explicitly in the memory of the computer. To put this idea into practice, we will construct objects that provides access to all of the elements of some sequential dataset that an application may desire, but without computing all of those elements in advance and storing them. A simple example of this idea arises in the range sequence type introduced in Chapter 2. A range represents a consecutive, bounded sequence of integers. However, it is not the case that each element of that sequence is represented explicitly in memory. Instead, when an element is requested from a range, it is computed. Hence, we can represent very large ranges of integers without using large blocks of memory. Only the end points of the range are stored as part of the range object, and elements are computed on the fly. In this example, not all 999,990,000 integers in this range are stored when the range instance is constructed. Instead, the range object adds the first element 10,000 to the index 45,006,230 to produce the element 45,016,230. Computing values on demand, rather than retrieving them from an existing representation, is an example of lazy computation. Computer science is a discipline that celebrates laziness as an important computational tool. An iterator is an object that provides sequential access to an underlying sequential dataset. Iterators are built-in objects in many programming languages, including Python. The iterator abstraction has two components: a mechanism for retrieving the next element in some underlying series of elements and a mechanism for signaling that the end of the series has been reached and no further elements remain. In programming languages with built-in object systems, this abstraction typically corresponds to a particular interface that can be implemented by classes. The Python interface for iterators is described in the next section. The usefulness of iterators is derived from the fact that the underlying series of data for an iterator may not be represented explicitly in memory. An iterator provides a mechanism for considering each of a series of values in turn, but all of those elements do not need to be stored simultaneously. Instead, when the next element is requested from an iterator, that element may be computed on demand instead of being retrieved from an existing memory source. Ranges are able to compute the elements of a sequence lazily because the sequence represented is uniform, and any element is easy to compute from the starting and ending bounds of the range. Iterators allow for lazy generation of a much broader class of underlying sequential datasets, because they do not need to provide access to arbitrary elements of the underlying series. Instead, they must only compute the next element of the series, in order, each time another element is requested. While not as flexible as accessing arbitrary elements of a sequence (called random access), sequential access to sequential data series is often sufficient for data processing applications. The Python iterator interface includes two messages. The __next__ message queries the iterator for the next element of the underlying series that it represents. In response to invoking __next__ as a method, an iterator can perform arbitrary computation in order to either retrieve or compute the next element in an underlying series. Calls to __next__ make a mutating change to the iterator: they advance the position of the iterator. Hence, multiple calls to __next__ will return sequential elements of an underlying series. Python signals that the end of an underlying series has been reached by raising a StopIteration exception during a call to __next__. The Letters class below iterates over an underlying series of letters from a to d. The member variable current stores the current letter in the series, and the __next__ method returns this letter and uses it to compute a new value for current. The __iter__ message is the second required message of the Python iterator interface. It simply returns the iterator; it is useful for providing a common interface to iterators and sequences, as described in the next section. Using this class, we can access letters in sequence. A Letters instance can only be iterated through once. After its __next__() method raises a StopIteration exception, it continues to do so from then on. There is no way to reset it; one must create a new instance. Iterators also allow us to represent infinite series by implementing a __next__ method that never raises a StopIteration exception. For example, the Positives class below iterates over the infinite series of positive integers. The built-in next function in Python invokes the __next__ method on its argument. To execute a for statement, Python evaluates the header <expression>, which must yield an iterable value. Then, the __iter__ method is invoked on that value. Until a StopIteration exception is raised, Python repeatedly invokes the __next__ method on that iterator and binds the result to the <name> in the for statement. Then, it executes the <suite>. In the above example, the counts list returns an iterator from its __iter__() method. The for statement then calls that iterator's __next__() method repeatedly, and assigns the returned value to item each time. This process continues until the iterator raises a StopIteration exception, at which point execution of the for statement concludes. With our knowledge of iterators, we can implement the execution rule of a for statement in terms of while, assignment, and try statements. Above, the iterator returned by invoking the __iter__ method of counts is bound to a name items so that it can be queried for each element in turn. The handling clause for the StopIteration exception does nothing, but handling the exception provides a control mechanism for exiting the while loop. The Letters and Positives objects above require us to introduce a new field self.current into our object to keep track of progress through the sequence. With simple sequences like those shown above, this can be done easily. With complex sequences, however, it can be quite difficult for the __next__ method to save its place in the calculation. Generators allow us to define more complicated iterations by leveraging the features of the Python interpreter. A generator is an iterator returned by a special class of function called a generator function. Generator functions are distinguished from regular functions in that rather than containing return statements in their body, they use yield statement to return elements of a series. Generators do not use attributes of an object to track their progress through a series. Instead, they control the execution of the generator function, which runs until the next yield statement is executed each time the generator's __next__ method is invoked. The Letters iterator can be implemented much more compactly using a generator function. Even though we never explicitly defined __iter__ or __next__ methods, the yield statement indicates that we are defining a generator function. When called, a generator function doesn't return a particular yielded value, but instead a generator (which is a type of iterator) that itself can return the yielded values. A generator object has __iter__ and __next__ methods, and each call to __next__ continues execution of the generator function from wherever it left off previously until another yield statement is executed. The first time __next__ is called, the program executes statements from the body of the letters_generator function until it encounters the yield statement. Then, it pauses and returns the value of current. yield statements do not destroy the newly created environment, they preserve it for later. When __next__ is called again, execution resumes where it left off. The values of current and of any other bound names in the scope of letters_generator are preserved across subsequent calls to __next__. The generator does not start executing any of the body statements of its generator function until the first time __next__ is invoked. The generator raises a StopIteration exception whenever its generator function returns. In Python, iterators only make a single pass over the elements of an underlying series. After that pass, the iterator will continue to raise a StopIteration exception when __next__ is invoked. Many applications require iteration over elements multiple times. For example, we have to iterate over a list many times in order to enumerate all pairs of elements. Sequences are not themselves iterators, but instead iterable objects. The iterable interface in Python consists of a single message, __iter__, that returns an iterator. The built-in sequence types in Python return new instances of iterators when their __iter__ methods are invoked. If an iterable object returns a fresh instance of an iterator each time __iter__ is called, then it can be iterated over multiple times. New iterable classes can be defined by implementing the iterable interface. For example, the iterable LetterIterable class below returns a new iterator over letters each time __iter__ is invoked. The __iter__ method is a generator function; it returns a generator object that yields the letters 'a' through 'd'. A Letters iterator object gets "used up" after a single iteration, whereas the LetterIterable object can be iterated over multiple times. As a result, a LetterIterable instance can serve as an argument to all_pairs. Streams offer another way to represent sequential data implicitly. A stream is a lazily computed recursive list. Like the Rlist class from Chapter 3, a Stream instance responds to requests for its first element and the rest of the stream. Like an Rlist, the rest of a Stream is itself a Stream. Unlike an Rlist, the rest of a stream is only computed when it is looked up, rather than being stored in advance. That is, the rest of a stream is computed lazily. To achieve this lazy evaluation, a stream stores a function that computes the rest of the stream. Whenever this function is called, its returned value is cached as part of the stream in an attribute called _rest, named with an underscore to indicate that it should not be accessed directly. The accessible attribute rest is a property method that returns the rest of the stream, computing it if necessary. With this design, a stream stores how to compute the rest of the stream, rather than always storing it explicitly. """A lazily computed recursive list.""" """Return the rest of the stream, computing it if necessary.""" Likewise, we can create a Stream representing the same series. The Stream does not actually compute the second element 5 until the rest of the stream is requested. Here, 1 is the first element of the stream, and the lambda expression that follows returns a function for computing the rest of the stream. Accessing the elements of recursive list r and stream s proceed similarly. However, while 5 is stored within r, it is computed on demand for s via addition the first time that it is requested. While the rest of r is a two-element recursive list, the rest of s includes a function to compute the rest; the fact that it will return the empty stream may not yet have been discovered. When a Stream instance is constructed, the field self._computed is False, signifying that the _rest of the Stream has not yet been computed. When the rest attribute is requested via a dot expression, the rest method is invoked, which triggers computation with self._rest = self.compute_rest(). Because of the caching mechanism within a Stream, the compute_rest function is only ever called once, then discarded. The essential properties of a compute_rest function are that it takes no arguments, and it returns a Stream or Stream.empty. Lazy evaluation gives us the ability to represent infinite sequential datasets using streams. For example, we can represent increasing integers, starting at any first value. When make_integer_stream is called for the first time, it returns a stream whose first is the first integer in the sequence (1 by default). However, make_integer_stream is actually recursive because this stream's compute_rest calls make_integer_stream again, with an incremented argument. This makes make_integer_stream recursive, but also lazy. Recursive calls are only made to make_integer_stream whenever the rest of an integer stream is requested. The same higher-order functions that manipulate sequences -- map and filter -- also apply to streams, although their implementations must change to apply their argument functions lazily. The function map_stream maps a function over a stream, which produces a new stream. The locally defined compute_rest function ensures that the function will be mapped onto the rest of the stream whenever the rest is computed. A stream can be filtered by defining a compute_rest function that applies the filter function to the rest of the stream. If the filter function rejects the first element of the stream, the rest is computed immediately. Because filter_stream is recursive, the rest may be computed multiple times until a valid first element is found. The map_stream and filter_stream functions exhibit a common pattern in stream processing: a locally defined compute_rest function recursively applies a processing function to the rest of the stream whenever the rest is computed. To inspect the contents of a stream, we can coerce up to the first k elements to a Python list. These convenience functions allow us to verify our map_stream implementation with a simple example that squares the integers from 3 to 7. We can use our filter_stream function to define a stream of prime numbers using the sieve of Eratosthenes, which filters a stream of integers to remove all numbers that are multiples of its first element. By successively filtering with each prime, all composite numbers are removed from the stream. By truncating the primes stream, we can enumerate any prefix of the prime numbers. Streams contrast with iterators in that they can be passed to pure functions multiple times and yield the same result each time. The primes stream is not "used up" by converting it to a list. That is, the first element of prime_numbers is still 2 after converting the prefix of the stream to a list. Just as recursive lists provide a simple implementation of the sequence abstraction, streams provide a simple, functional, recursive data structure that implements lazy evaluation through the use of higher-order functions. In addition to streams, data values are often stored in large repositories called databases. A database consists of a data store containing structured data values and an interface for retrieving subsets of the data based on their characteristics. Each value stored in a database is called a record. Records are typically retrieved via a query, which is an expression in a query programming language. By far the most ubiquitous query language in use today is called Structured Query Language or SQL (pronounced "sequel"). SQL is an example of a declarative programming language. Expressions do not describe computations directly, but instead state the form of the result of some computation. It is the role of the query interpreter of the database system to design and perform a computational process to produce such a result. This interaction differs substantially from the procedural programming paradigm of Python or Scheme. In Python, computational processes are described directly by the programmer. A declarative language specifies the form of the result, but abstracts away procedural details. In this section, we introduce a declarative query language called logic, designed specifically for this text. It is based upon Prolog and the declarative language in Structure and Interpretation of Computer Programs. Data records are expressed as Scheme lists, and queries are expressed as Scheme values. The logic is a complete implementation that depends upon the Scheme project of the previous chapter. Each fact is not a procedure application, as in a Scheme expression, but instead a relation that is declared. "The dog Abraham is the parent of Barack," declares the first fact. Relation types do not need to be defined in advance. Relations are not applied, but instead matched to queries. The query interpreter responds with Success! to indicate that the query matches some fact. The following lines show substitutions of the variable ?child that match the query to the facts in the database. The query above requires the query interpreter to combine the fact that defines child with the various parent facts about fillmore. The user of the language does not need to know how this information is combined, but only that the result has a particular form. It is up to the query interpreter to prove that (child abraham fillmore) is true, given the available facts. In this way, a single fact can imply a large number of additional facts, or even infinitely many, as long as the query interpreter is able to discover them. Although it may appear that our query interpreter is quite intelligent, we will see that it finds these combinations through one simple operation repeated many times: that of matching two lists that contain variables in an environment. This section describes an implementation of the query interpreter that performs inference in the logic language. The interpreter is a general problem solver, but has substantial limitations on the scale and type of problems it can solve. More sophisticated logical programming languages exist, but the construction of efficient inference procedures remains an active research topic in computer science. The fundamental operation performed by the query interpreter is called unification. Unification is a general method of matching a query to a fact, each of which may contain variables. The query interpreter applies this operation repeatedly, first to match the original query to conclusions of facts, and then to match the hypotheses of facts to other conclusions in the database. In doing so, the query interpreter performs a search through the space of all facts related to a query. If it finds a way to support that query with an assignment of values to variables, it returns that assignment as a successful result. In order to return simple facts that match a query, the interpreter must match a query that contains variables with a fact that does not. For example, the query (query (parent abraham ?child)) and the fact (fact (parent abraham barack)) match, if the variable ?child takes the value barack. In general, a pattern matches some expression (a possibly nested Scheme list) if there is a binding of variable names to values such that substituting those values into the pattern yields the expression. For example, the expression ((a b) c (a b)) matches the pattern (?x c ?x) with variable ?x bound to value (a b). The same expression matches the pattern ((a ?y) ?z (a b)) with variable ?y bound to b and ?z bound to c.
The following examples can be replicated by importing the provided logic example program. Both queries and facts are represented as Scheme lists in the logic language, using the same Pair class and nil object in the previous chapter. For example, the query expression (?x c ?x) is represented as nested Pair instances. As in the Scheme project, an environment that binds symbols to values is represented with an instance of the Frame class, which has an attribute called bindings. The function that performs pattern matching in the logic language is called unify. It takes two inputs, e and f, as well as an environment env that records the bindings of variables to values. Above, the return value of True from unify indicates that the pattern f was able to match the expression e. The result of unification is recorded in the binding in env of ?x to (a b). Unification is a generalization of pattern matching that attempts to find a mapping between two expressions that may both contain variables. The unify function implements unification via a recursive process, which performs unification on corresponding parts of two expressions until a contradiction is reached or a viable binding to all variables can be established. To match the first element of each pattern, the variable ?x is bound to the expression (a ?y c). To match the second element of each pattern, first the variable ?x is replaced by its value. Then, (a ?y c) is matched to (a b ?z) by binding ?y to b and ?z to c.
The result of unification may bind a variable to an expression that also contains variables, as we see above with ?x bound to (a ?y c). The bind function recursively and repeatedly binds all variables to their values in an expression until no bound variables remain. In general, unification proceeds by checking several conditions. The implementation of unify directly follows the description below. Both inputs e and f are replaced by their values if they are variables. If e and f are equal, unification succeeds. If e is a variable, unification succeeds and e is bound to f.
If f is a variable, unification succeeds and f is bound to e.
If neither is a variable, both are not lists, and they are not equal, then e and f cannot be unified, and so unification fails. If none of these cases holds, then e and f are both pairs, and so unification is performed on both their first and second corresponding elements. case (its existing bindings are never changed).""" One way to think about the logic language is as a prover of assertions in a formal system. Each stated fact establishes an axiom in a formal system, and each query must be established by the query interpreter from these axioms. That is, each query asserts that there is some assignment to its variables such that all of its sub-expressions simultaneously follow from the facts of the system. The role of the query interpreter is to verify that this is so. Each of the three assignments shown in the result is a trace of a larger proof that the query is true given the facts. A full proof would include all of the facts that were used, for instance including (parent abraham clinton) and (parent fillmore abraham). In order to establish a query from the facts already established in the system, the query interpreter performs a search in the space of all possible facts. Unification is the primitive operation that pattern matches two expressions. The search procedure in a query interpreter chooses what expressions to unify in order to find a set of facts that chain together to establishes the query. The recursive search function implements the search procedure for the logic language. It takes as input the Scheme list of clauses in the query, an environment env containing current bindings of symbols to values (initially empty), and the depth of the chain of rules that have been chained together already. the nested application of DEPTH rules.""" The search to satisfy all clauses simultaneously begins with the first clause. For each fact in the database, search attempts to unify the first clause of the fact with the first clause of the query. Unification is performed in a new environment env_head. As a side effect of unification, variables are bound to values in env_head. If unification is successful, then the clause matches the conclusion of the current rule. The following for statement attempts to establish the hypotheses of the rule, so that the conclusion can be established. It is here that the hypotheses of a recursive rule would be passed recursively to search in order to be established. Finally, for every successful search of fact.second, the resulting environment is bound to env_rule. Given these bindings of values to variables, the final for statement searches to establish the rest of the clauses in the initial query. Any successful result is returned via the inner yield statement. Unique names. Unification assumes that no variable is shared among both e and f. However, we often reuse variable names in the facts and queries of the logic language. We would not like to confuse an ?x in one fact with an ?x in another; these variables are unrelated. To ensure that names are not confused, before a fact is passed into unify, its variable names are replaced by unique names using rename_variables by appending a unique integer for the fact. """Rename all variables in EXPR with an identifier N."""
The remaining details, including the user interface to the logic language and the definition of various helper functions, appears in the logic example. Large-scale data processing applications often coordinate effort among multiple computers. A distributed computing application is one in which multiple interconnected but independent computers coordinate to perform a joint computation. Different computers are independent in the sense that they do not directly share memory. Instead, they communicate with each other using messages, information transferred from one computer to another over a network. Messages sent between computers are sequences of bytes. The purpose of a message varies; messages can request data, send data, or instruct another computer to evaluate a procedure call. In all cases, the sending computer must encode information in a way that the receiving computer can decode and correctly interpret. To do so, computers adopt a message protocol that endows meaning to sequences of bytes. A message protocol is a set of rules for encoding and interpreting messages. Both the sending and receiving computers must agree on the semantics of a message to enable successful communication. Many message protocols specify that a message conform to a particular format in which certain bits at fixed positions indicate fixed conditions. Others use special bytes or byte sequences to delimit parts of the message, much as punctuation delimits sub-expressions in the syntax of a programming language. Message protocols are not particular programs or software libraries. Instead, they are rules that can be applied by a variety of programs, even written in different programming languages. As a result, computers with vastly different software systems can participate in the same distributed system, simply by conforming to the message protocols that govern the system. The TCP/IP Protocols. On the Internet, messages are transferred from one machine to another using the Internet Protocol (IP), which specifies how to transfer packets of data among different networks to allow global Internet communication. IP was designed under the assumption that networks are inherently unreliable at any point and dynamic in structure. Moreover, it does not assume that any central tracking or monitoring of communication exists. Each packet contains a header containing the destination IP address, along with other information. All packets are forwarded throughout the network toward the destination using simple routing rules on a best-effort basis. This design imposes constraints on communication. Packets transferred using modern IP implementations (IPv4 and IPv6) have a maximum size of 65,535 bytes. Larger data values must be split among multiple packets. The IP does not guarantee that packets will be received in the same order that they were sent. Some packets may be lost, and some packets may be transmitted multiple times. The Transmission Control Protocol is an abstraction defined in terms of the IP that provides reliable, ordered transmission of arbitrarily large byte streams. The protocol provides this guarantee by correctly ordering packets transferred by the IP, removing duplicates, and requesting retransmission of lost packets. This improved reliability comes at the expense of latency, the time required to send a message from one point to another. The TCP breaks a stream of data into TCP segments, each of which includes a portion of the data preceded by a header that contains sequence and state information to support reliable, ordered transmission of data. Some TCP segments do not include data at all, but instead establish or terminate a connection between two computers. A sends a request to a port of B to establish a TCP connection, providing a port number to which to send the response. B sends a response to the port specified by A and waits for its response to be acknowledged. A sends an acknowledgment response, verifying that data can be transferred in both directions. After this three-step "handshake", the TCP connection is established, and A and B can send data to each other. Terminating a TCP connection proceeds as a sequence of steps in which both the client and server request and acknowledge the end of the connection. The client/server architecture is a way to dispense a service from a central source. A server provides a service and multiple clients communicate with the server to consume that service. In this architecture, clients and servers have different roles. The server's role is to respond to service requests from clients, while a client's role is to issue requests and make use of the server's response in order to perform some task. The diagram below illustrates the architecture. The most influential use of the model is the modern World Wide Web. When a web browser displays the contents of a web page, several programs running on independent computers interact using the client/server architecture. This section describes the process of requesting a web page in order to illustrate central ideas in client/server distributed systems. Roles. The web browser application on a Web user's computer has the role of the client when requesting a web page. When requesting the content from a domain name on the Internet, such as www.nytimes.com, it must communicate with at least two different servers. The client first requests the Internet Protocol (IP) address of the computer located at that name from a Domain Name Server (DNS). A DNS provides the service of mapping domain names to IP addresses, which are numerical identifiers of machines on the Internet. Python can make such a request directly using the socket module. The client then requests the contents of the web page from the web server located at that IP address. The response in this case is an HTML document that contains headlines and article excerpts of the day's news, as well as expressions that indicate how the web browser client should lay out that contents on the user's screen. Python can make the two requests required to retrieve this content using the urllib.request module. Upon receiving this response, the browser issues additional requests for images, videos, and other auxiliary components of the page. These requests are initiated because the original HTML document contains addresses of additional content and a description of how they embed into the page. An HTTP Request. The Hypertext Transfer Protocol (HTTP) is a protocol implemented using TCP that governs communication for the World Wide Web (WWW). It assumes a client/server architecture between a web browser and a web server. HTTP specifies the format of messages exchanged between browsers and servers. All web browsers use the HTTP format to request pages from a web server, and all web servers use the HTTP format to send back their responses. HTTP requests have several types, the most common of which is a GET request for a specific web page. A GET request specifies a location. For instance, typing the address http://en.wikipedia.org/wiki/UC_Berkeley into a web browser issues an HTTP GET request to port 80 of the web server at en.wikipedia.org for the contents at location /wiki/UC_Berkeley. On the first line, the text 200 OK indicates that there were no errors in responding to the request. The subsequent lines of the header give information about the server, the date, and the type of content being sent back. The numbers 200 and 404 are HTTP response codes. A fixed set of response codes is a common feature of a message protocol. Designers of protocols attempt to anticipate common messages that will be sent via the protocol and assign fixed codes to reduce transmission size and establish a common message semantics. In the HTTP protocol, the 200 response code indicates success, while 404 indicates an error that a resource was not found. A variety of other response codes exist in the HTTP 1.1 standard as well. Modularity. The concepts of client and server are powerful abstractions. 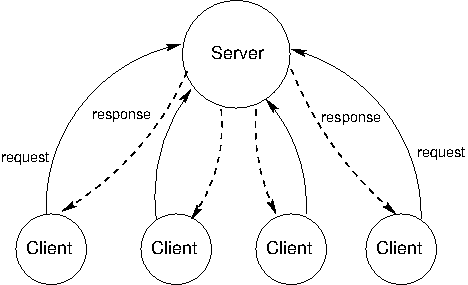 A server provides a service, possibly to multiple clients simultaneously, and a client consumes that service. The clients do not need to know the details of how the service is provided, or how the data they are receiving is stored or calculated, and the server does not need to know how its responses are going to be used. On the web, we think of clients and servers as being on different machines, but even systems on a single machine can have client/server architectures. For example, signals from input devices on a computer need to be generally available to programs running on the computer. The programs are clients, consuming mouse and keyboard input data. The operating system's device drivers are the servers, taking in physical signals and serving them up as usable input. In addition, the central processing unit (CPU) and the specialized graphical processing unit (GPU) often participate in a client/server architecture with the CPU as the client and the GPU as a server of images. A drawback of client/server systems is that the server is a single point of failure. It is the only component with the ability to dispense the service. There can be any number of clients, which are interchangeable and can come and go as necessary. Another drawback of client-server systems is that computing resources become scarce if there are too many clients. Clients increase the demand on the system without contributing any computing resources. The client/server model is appropriate for service-oriented situations. However, there are other computational goals for which a more equal division of labor is a better choice. The term peer-to-peer is used to describe distributed systems in which labor is divided among all the components of the system. All the computers send and receive data, and they all contribute some processing power and memory. As a distributed system increases in size, its capacity of computational resources increases. In a peer-to-peer system, all components of the system contribute some processing power and memory to a distributed computation. Division of labor among all participants is the identifying characteristic of a peer-to-peer system. This means that peers need to be able to communicate with each other reliably. In order to make sure that messages reach their intended destinations, peer-to-peer systems need to have an organized network structure. The components in these systems cooperate to maintain enough information about the locations of other components to send messages to intended destinations. In some peer-to-peer systems, the job of maintaining the health of the network is taken on by a set of specialized components. Such systems are not pure peer-to-peer systems, because they have different types of components that serve different functions. The components that support a peer-to-peer network act like scaffolding: they help the network stay connected, they maintain information about the locations of different computers, and they help newcomers take their place within their neighborhood. The most common applications of peer-to-peer systems are data transfer and data storage. For data transfer, each computer in the system contributes to send data over the network. If the destination computer is in a particular computer's neighborhood, that computer helps send data along. For data storage, the data set may be too large to fit on any single computer, or too valuable to store on just a single computer. Each computer stores a small portion of the data, and there may be multiple copies of the same data spread over different computers. When a computer fails, the data that was on it can be restored from other copies and put back when a replacement arrives. Skype, the voice- and video-chat service, is an example of a data transfer application with a peer-to-peer architecture. When two people on different computers are having a Skype conversation, their communications are transmitted through a peer-to-peer network. This network is composed of other computers running the Skype application. Each computer knows the location of a few other computers in its neighborhood. A computer helps send a packet to its destination by passing it on a neighbor, which passes it on to some other neighbor, and so on, until the packet reaches its intended destination. Skype is not a pure peer-to-peer system. A scaffolding network of supernodes is responsible for logging-in and logging-out users, maintaining information about the locations of their computers, and modifying the network structure when users enter and exit. Distributed systems are often used to collect, access, and manipulate large data sets. For example, the database systems described earlier in the chapter can operate over datasets that are stored across multiple machines. No single machine may contain the data necessary to respond to a query, and so communication is required to service requests. This section investigates a typical big data processing scenario in which a data set too large to be processed by a single machine is instead distributed among many machines, each of which process a portion of the dataset. The result of processing must often be aggregated across machines, so that results from one machine's computation can be combined with others. To coordinate this distributed data processing, we will discuss a programming framework called MapReduce. Creating a distributed data processing application with MapReduce combines many of the ideas presented throughout this text. An application is expressed in terms of pure functions that are used to map over a large dataset and then to reduce the mapped sequences of values into a final result. Familiar concepts from functional programming are used to maximal advantage in a MapReduce program. MapReduce requires that the functions used to map and reduce the data be pure functions. In general, a program expressed only in terms of pure functions has considerable flexibility in how it is executed. Sub-expressions can be computed in arbitrary order and in parallel without affecting the final result. A MapReduce application evaluates many pure functions in parallel, reordering computations to be executed efficiently in a distributed system. The map and reduce functions that process data and combine results. The communication and coordination between machines. The coordination mechanism handles many issues that arise in distributed computing, such as machine failures, network failures, and progress monitoring. While managing these issues introduces some complexity in a MapReduce application, none of that complexity is exposed to the application developer. Instead, building a MapReduce application only requires specifying the map and reduce functions in (1) above; the challenges of distributed computation are hidden via abstraction. The MapReduce framework assumes as input a large, unordered stream of input values of an arbitrary type. For instance, each input may be a line of text in some vast corpus. Computation proceeds in three steps. A map function is applied to each input, which outputs zero or more intermediate key-value pairs of an arbitrary type. All intermediate key-value pairs are grouped by key, so that pairs with the same key can be reduced together. A reduce function combines the values for a given key k; it outputs zero or more values, which are each associated with k in the final output. To perform this computation, the MapReduce framework creates tasks (perhaps on different machines) that perform various roles in the computation. A map task applies the map function to some subset of the input data and outputs intermediate key-value pairs. A reduce task sorts and groups key-value pairs by key, then applies the reduce function to the values for each key. All communication between map and reduce tasks is handled by the framework, as is the task of grouping intermediate key-value pairs by key. In order to utilize multiple machines in a MapReduce application, multiple mappers run in parallel in a map phase, and multiple reducers run in parallel in a reduce phase. In between these phases, the sort phase groups together key-value pairs by sorting them, so that all key-value pairs with the same key are adjacent. """A map function that counts the vowels in a line.""" The reduce function is the built-in sum functions in Python, which takes as input an iterator over values (all values for a given key) and returns their sum. To specify a MapReduce application, we require an implementation of the MapReduce framework into which we can insert map and reduce functions. In the following section, we will use the open-source Hadoop implementation. In this section, we develop a minimal implementation using built-in tools of the Unix operating system. The Unix operating system creates an abstraction barrier between user programs and the underlying hardware of a computer. It provides a mechanism for programs to communicate with each other, in particular by allowing one program to consume the output of another. In their seminal text on Unix programming, Kernigham and Pike assert that, ""The power of a system comes more from the relationships among programs than from the programs themselves." The mapreduce module is a companion module to this text that provides the functions emit to emit a key-value pair and group_values_by_key to group together values that have the same key. This module also includes an interface to the Hadoop distributed implementation of MapReduce. Hadoop is the name of an open-source implementation of the MapReduce framework that executes MapReduce applications on a cluster of machines, distributing input data and computation for efficient parallel processing. Its streaming interface allows arbitrary Unix programs to define the map and reduce functions. In fact, our count_vowels_mapper.py and sum_reducer.py can be used directly with a Hadoop installation to compute vowel counts on large text corpora. Hadoop offers several advantages over our simplistic local MapReduce implementation. The first is speed: map and reduce functions are applied in parallel using different tasks on different machines running simultaneously. The second is fault tolerance: when a task fails for any reason, its result can be recomputed by another task in order to complete the overall computation. The third is monitoring: the framework provides a user interface for tracking the progress of a MapReduce application. where [input] and [output] are directories in the Hadoop file system. For more information on the Hadoop streaming interface and use of the system, consult the Hadoop Streaming Documentation. From the 1970s through the mid-2000s, the speed of individual processor cores grew at an exponential rate. Much of this increase in speed was accomplished by increasing the clock frequency, the rate at which a processor performs basic operations. In the mid-2000s, however, this exponential increase came to an abrupt end, due to power and thermal constraints, and the speed of individual processor cores has increased much more slowly since then. Instead, CPU manufacturers began to place multiple cores in a single processor, enabling more operations to be performed concurrently. Parallelism is not a new concept. Large-scale parallel machines have been used for decades, primarily for scientific computing and data analysis. Even in personal computers with a single processor core, operating systems and interpreters have provided the abstraction of concurrency. This is done through context switching, or rapidly switching between different tasks without waiting for them to complete. Thus, multiple programs can run on the same machine concurrently, even if it only has a single processing core. Given the current trend of increasing the number of processor cores, individual applications must now take advantage of parallelism in order to run faster. Within a single program, computation must be arranged so that as much work can be done in parallel as possible. However, parallelism introduces new challenges in writing correct code, particularly in the presence of shared, mutable state. For problems that can be solved efficiently in the functional model, with no shared mutable state, parallelism poses few problems. Pure functions provide referential transparency, meaning that expressions can be replaced with their values, and vice versa, without affecting the behavior of a program. This enables expressions that do not depend on each other to be evaluated in parallel. As discussed in the previous section, the MapReduce framework allows functional programs to be specified and run in parallel with minimal programmer effort. Unfortunately, not all problems can be solved efficiently using functional programming. The Berkeley View project has identified thirteen common computational patterns in science and engineering, only one of which is MapReduce. The remaining patterns require shared state. In the remainder of this section, we will see how mutable shared state can introduce bugs into parallel programs and a number of approaches to prevent such bugs. We will examine these techniques in the context of two applications, a web crawler and a particle simulator. Before we dive deeper into the details of parallelism, let us first explore Python's support for parallel computation. Python provides two means of parallel execution: threading and multiprocessing. Threading. In threading, multiple "threads" of execution exist within a single interpreter. Each thread executes code independently from the others, though they share the same data. However, the CPython interpreter, the main implementation of Python, only interprets code in one thread at a time, switching between them in order to provide the illusion of parallelism. On the other hand, operations external to the interpreter, such as writing to a file or accessing the network, may run in parallel. The Thread constructor creates a new thread. It requires a target function that the new thread should run, as well as the arguments to that function. Calling start on a Thread object marks it ready to run. The current_thread function returns the Thread object associated with the current thread of execution. In this example, the prints can happen in any order, since we haven't synchronized them in any way. Multiprocessing. Python also supports multiprocessing, which allows a program to spawn multiple interpreters, or processes, each of which can run code independently. These processes do not generally share data, so any shared state must be communicated between processes. On the other hand, processes execute in parallel according to the level of parallelism provided by the underlying operating system and hardware. Thus, if the CPU has multiple processor cores, Python processes can truly run concurrently. As this example demonstrates, many of the classes and functions in multiprocessing are analogous to those in threading. This example also demonstrates how lack of synchronization affects shared state, as the display can be considered shared state. Here, the interpreter prompt from the interactive process appears before the print output from the other process. In this program, two threads attempt to increment the same counter. The CPython interpreter can switch between threads at almost any time. Only the most basic operations are atomic, meaning that they appear to occur instantly, with no switch possible during their evaluation or execution. Incrementing a counter requires multiple basic operations: read the old value, add one to it, and write the new value. The interpreter can switch threads between any of these operations. The end result is that the counter has a value of 1, even though it was incremented twice! Worse, the interpreter may only switch at the wrong time very rarely, making this difficult to debug. Even with the sleep call, this program sometimes produces a correct count of 2 and sometimes an incorrect count of 1. This problem arises only in the presence of shared data that may be mutated by one thread while another thread accesses it. Such a conflict is called a race condition, and it is an example of a bug that only exists in the parallel world. In order to avoid race conditions, shared data that may be mutated and accessed by multiple threads must be protected against concurrent access. For example, if we can ensure that thread 1 only accesses the counter after thread 0 finishes accessing it, or vice versa, we can guarantee that the right result is computed. We say that shared data is synchronized if it is protected from concurrent access. In the next few subsections, we will see multiple mechanisms providing synchronization. In some cases, access to shared data need not be synchronized, if concurrent access cannot result in incorrect behavior. The simplest example is read-only data. Since such data is never mutated, all threads will always read the same values regardless when they access the data. Here, the producer thread adds items to items, while the consumer waits until flag is non-empty. When the producer finishes adding items, it adds an element to flag, allowing the consumer to proceed. In most Python implementations, this example will work correctly. However, a common optimization in other compilers and interpreters, and even the hardware itself, is to reorder operations within a single thread that do not depend on each other for data. In such a system, the statement flag.append('go') may be moved before the loop, since neither depends on the other for data. In general, you should avoid code like this unless you are certain that the underlying system won't reorder the relevant operations. There are a few changes to this code, in addition to the Queue and get and put calls. We have marked the consumer thread as a daemon, which means that the program will not wait for that thread to complete before exiting. This allows us to use an infinite loop in the consumer. However, we do need to ensure that the main thread exits, but only after all items have been consumed from the Queue. The consumer calls the task_done method to inform the Queue that it is done processing an item, and the main thread calls the join method, which waits until all items have been processed, ensuring that the program exits only after that is the case. A more complex example that makes use of a Queue is a parallel web crawler that searches for dead links on a website. This crawler follows all links that are hosted by the same site, so it must process a number of URLs, continually adding new ones to a Queue and removing URLs for processing. By using a synchronized Queue, multiple threads can safely add to and remove from the data structure concurrently. When a synchronized version of a particular data structure is not available, we have to provide our own synchronization. A lock is a basic mechanism to do so. It can be acquired by at most one thread, after which no other thread may acquire it until it is released by the thread that previously acquired it. In Python, the threading module contains a Lock class to provide locking. A Lock has acquire and release methods to acquire and release the lock, and the class guarantees that only one thread at a time can acquire it. All other threads that attempt to acquire a lock while it is already being held are forced to wait until it is released. For a lock to protect a particular set of data, all the threads need to be programmed to follow a rule: no thread will access any of the shared data unless it owns that particular lock. In effect, all the threads need to "wrap" their manipulation of the shared data in acquire and release calls for that lock. A lock is necessary here, in order to prevent another thread from adding the URL to the set between this thread checking if it is in the set and adding it to the set. Furthermore, adding to a set is not atomic, so concurrent attempts to add to a set may corrupt its internal data. Operations that must be synchronized with each other must use the same lock. However, two disjoint sets of operations that must be synchronized only with operations in the same set should use two different lock objects to avoid over-synchronization. Another way to avoid conflicting access to shared data is to divide a program into phases, ensuring that shared data is mutated in a phase in which no other thread accesses it. A barrier divides a program into phases by requiring all threads to reach it before any of them can proceed. Code that is executed after a barrier cannot be concurrent with code executed before the barrier. In this example, reading and writing to shared data take place in different phases, separated by barriers. The writes occur in the same phase, but they are disjoint; this disjointness is necessary to avoid concurrent writes to the same data in the same phase. Since this code is properly synchronized, both counters will always be 10 at the end. The multithreaded particle simulator uses a barrier in a similar fashion to synchronize access to shared data. In the simulation, each thread owns a number of particles, all of which interact with each other over the course of many discrete timesteps. A particle has a position, velocity, and acceleration, and a new acceleration is computed in each timestep based on the positions of the other particles. The velocity of the particle must be updated accordingly, and its position according to its velocity. As with the simple example above, there is a read phase, in which all particles' positions are read by all threads. Each thread updates its own particles' acceleration in this phase, but since these are disjoint writes, they need not be synchronized. In the write phase, each thread updates its own particles' velocities and positions. Again, these are disjoint writes, and they are protected from the read phase by barriers. A final mechanism to avoid improper mutation of shared data is to entirely avoid concurrent access to the same data. In Python, using multiprocessing rather than threading naturally results in this, since processes run in separate interpreters with their own data. Any state required by multiple processes can be communicated by passing messages between processes. The Pipe class in the multiprocessing module provides a communication channel between processes. By default, it is duplex, meaning a two-way channel, though passing in the argument False results in a one-way channel. The send method sends an object over the channel, while the recv method receives an object. The latter is blocking, meaning that a process that calls recv will wait until an object is received. In this example, we use a None message to signal the end of communication. We also passed in one end of the pipe as an argument to the target function when creating the consumer process. This is necessary, since state must be explicitly shared between processes. The multiprocess version of the particle simulator uses pipes to communicate particle positions between processes in each timestep. In fact, it uses pipes to set up an entire circular pipeline between processes, in order to minimize communication. Each process injects its own particles' positions into its pipeline stage, which eventually go through a full rotation of the pipeline. At each step of the rotation, a process applies forces from the positions that are currently in its own pipeline stage on to its own particles, so that after a full rotation, all forces have been applied to its particles. The multiprocessing module provides other synchronization mechanisms for processes, including synchronized queues, locks, and as of Python 3.3, barriers. For example, a lock or a barrier can be used to synchronize printing to the screen, avoiding the improper display output we saw previously. While synchronization methods are effective for protecting shared state, they can also be used incorrectly, failing to accomplish the proper synchronization, over-synchronizing, or causing the program to hang as a result of deadlock. Under-synchronization. A common pitfall in parallel computing is to neglect to properly synchronize shared accesses. In the set example, we need to synchronize the membership check and insertion together, so that another thread cannot perform an insertion in between these two operations. Failing to synchronize the two operations together is erroneous, even if they are separately synchronized. Over-synchronization. Another common error is to over-synchronize a program, so that non-conflicting operations cannot occur concurrently. As a trivial example, we can avoid all conflicting access to shared data by acquiring a master lock when a thread starts and only releasing it when a thread completes. This serializes our entire code, so that nothing runs in parallel. In some cases, this can even cause our program to hang indefinitely. For example, consider a consumer/producer program in which the consumer obtains the lock and never releases it. This prevents the producer from producing any items, which in turn prevents the consumer from doing anything since it has nothing to consume. While this example is trivial, in practice, programmers often over-synchronize their code to some degree, preventing their code from taking complete advantage of the available parallelism. Deadlock. Because they cause threads or processes to wait on each other, synchronization mechanisms are vulnerable to deadlock, a situation in which two or more threads or processes are stuck, waiting for each other to finish. We have just seen how neglecting to release a lock can cause a thread to get stuck indefinitely. But even if threads or processes do properly release locks, programs can still reach deadlock. 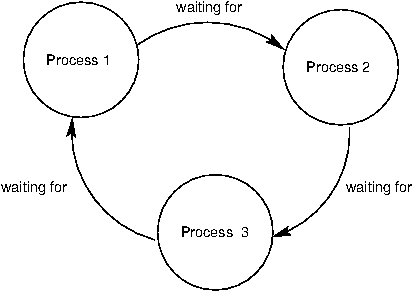 The source of deadlock is a circular wait, illustrated below with processes. No process can continue because it is waiting for other processes that are waiting for it to complete. Both processes attempt to receive data first. Recall that the recv method blocks until an item is available. Since neither process has sent anything, both will wait indefinitely for the other to send it data, resulting in deadlock. Synchronization operations must be properly aligned to avoid deadlock. This may require sending over a pipe before receiving, acquiring multiple locks in the same order, and ensuring that all threads reach the right barrier at the right time. As we have seen, parallelism presents new challenges in writing correct and efficient code. As the trend of increasing parallelism at the hardware level will continue for the foreseeable future, parallel computation will become more and more important in application programming. There is a very active body of research on making parallelism easier and less error-prone for programmers. Our discussion here serves only as a basic introduction to this crucial area of computer science.